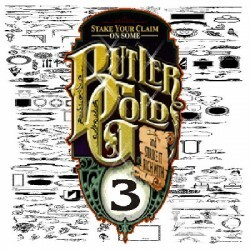 Butler Gold Clipart Volume 3 for Sign Painters, Pinstripers, Gilders and Designers. Well it is however at this time what we call our collection of eps. vectored files. What are they? They are Illustrator path files that are multi-talented....they can drive a plotter or a router or simply act as templates in the construction of designs of all sorts. They are all original designs created from the mind and hand of David Butler. Each element has been first drawn with a pencil and paper and then hand digitized in Photoshop. At the time of this writing we have three Volumes available...each having in the neighborhood of 200 images. Butler Door Plates Designs by David Butler Collection of eps vectorized files. Included in this volume are of course the vectored paths that you more ..
Butler Gold - Volume 1 Designs by David Butler Collection of eps.vectorized files. What are they? They are Illustrator path ..
Butler Gold - Volume 2 Designs by David Butler Collection of eps.vectorized files. What are they? They are Illustrator path files that are multi tale..
Butler Gold - Volume 3 Designs by David Butler Collection of eps.vectored files. What are they? They are Illustrator path files that are multi talent..